Ready for a spot of shopping? Are you tired of boring, common trips to the local shopping mall? Then it sounds like you need something a little different. It sounds like Diagon Alley might be the place for you! You can start by heading to Ollivanders' shop to pick up a brand new wand. After that, it's time for a stop at Eeylops Owl Emporium to find yourself a new magical friend. Of course, you won't want to miss out on a trip Weasleys' Wizard Wheezes and a trip to Leaky Cauldron is a must! But what are you going to carry all of your new wizarding swag in? 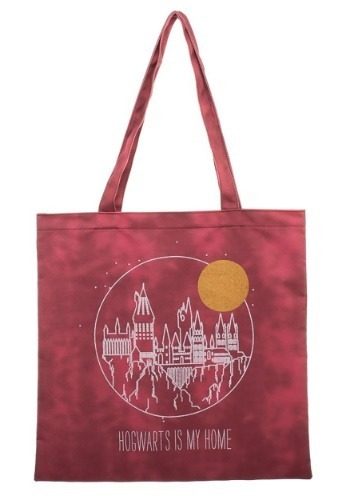 Well, what about this Harry Potter Hogwarts Tote Bag? This Harry Potter Hogwarts is My Home Canvas Tote bag is officially licensed from the movie series. It's made of sturdy material and features a printed image of Hogwarts on the side. It's great for a spot of shopping in Diagon Alley, or for using during some common muggle errands. This bag is great for shopping, but it's also a must-have to finish off any Harry Potter themed costume! It's the best trick or treating bag for anyone dressed as a full-fledged wizard.